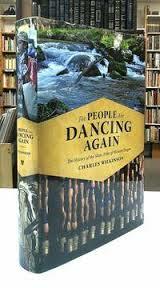 The People are Dancing Again: The History of the Siletz Tribe of Western Oregon, by Charles Wilkinson (Seattle: University of Washington Press, 2012). I have two main comments. 1) Page 50 is an example where reference is made to people “creating” CJ, for instance in connection with remarks on the (un)intelligibility of Kalapuyan languages to speakers of other Oregon languages. The Kalapuyan language was mutually unintelligible with all the surrounding languages, although accommodations were made through learning other languages and through the creation of the Chinook Jargon. This, I feel, only tends to perpetuate a misleading idea that Chinuk Wawa was consciously put together, for some specific purpose, on some definite occasion. He spoke at least half an hour in the Indian dialect. There was no [Chinook] jargon about it. You never heard the most polished orator use more perfect intonations and gestures — and the effect [of it] was the effect of true oratory. Grover is clearly not referring to CJ here. Instead, he’s using the 19th-century common noun “jargon”, which meant “gibberish; the speech of uneducated / common / working people”. (I get into this in a paper I gave in January about how Chinook Jargon came to be so named.) The editorial explanatory bracketing is in this case untrue to the original writer’s intent. Grover’s point is not to specify which language Jim was speaking, but to emphasize that the chief’s eloquence was incontestably on a par with any product of Europe. Hello, Captain Smith! You go on the reservation? You go on the reservation? Hiyu chick chick (many wagons traveling); Hiyu ikta (a great many good things); hiyu muckamuck (much food); Hiyu clothes; wake clatawa reservation (not to go to the reservation); take rope Capt Smith; do you see this rope Captain Smith? Ikta versus clothes here is a nice distinction; we would generally expect the latter to be iktas. Actually I wonder whether this speech was reported partly in English translation — rather than having been delivered in a mix of English and Chinuk Wawa. We know the latter was a linguistic strategy in many times and places in the Pacific Northwest, but my sense is that during the still-early contact period of the 1850’s Rogue River War, Aboriginal people knew very little English. That amounts to a quibble, probably worthy of a footnote in this meticulously documented volume, but it’s not a criticism of Wilkinson’s fine accomplishment. I’m just saying to all of you excellent researchers, “hire a linguist” who can help you grasp the important finer points of white and Native people’s historical communication with each other.